Private Bass Guitar tutoring lessons Lakeside, CA. Check out some of our most popular teachers near Lakeside, CA including San Diego, Chula Vista, Carlsbad, La Jolla and Oceanside. 40 students per week. I decided to move forward and take my musical experience with me to San Diego, where I currently teach, write, record, and perform my music with others who have similar goals and aspirations. I love playing in as many bands as possible. The main one I play in is called Quel Bordel. Some of the bands I've played in have given me the opportunity to perform with local and big named artists such as D.J. Artistic, Gary Wilson of Stones Throw Records, The Aristocrats, Terry Bozzio, Alan Holdsworth, and Tony Levin. As a full time musician and performer, I'm typically out gigging anywhere from 2-5 a week. As a teacher, I'm here to help you with where you want to be with guitar. Whether it's rock, pop, funk, hip hop, reggae, jazz, blues, indie, folk, and country, I can help you with the technical and theoretical side of things. My goal- To get you to become better than me. I find myself as an easy going teacher, and can provide that push when I see students getting more engaged in their lessons. I typically teach out of two main books, and it's optional for students to have their own copy of my recommended method books. I emphasize heavy chord vocabulary and steady rhythm. I believe that in order to be a good lead player, you would have to be a great rhythm player. As we develop technique, you can expect me to incorporate theory as to maintain an even share of the HOW's and WHY's. Moreover, expect to DO something with our lessons. Repetition is the mother of learning, and sometimes it comes down to the idea of 'monkey see, monkey do' before we can have in depth conversations about the application of your lessons in real situations. To me, music is very creative. So I'm a big believer on improvisation with both chords and scales. I believe in practical application when learning the songs you want to learn. So every student will have a unique way of learning the fundamentals only necessary to their personal goals. Alan was extremely nice and personable. I was very happy with the way he implemented my specific requests into my lesson, and I look forward to the next one! Allen is a great teacher! He's patient, encouraging, and has a nice way of explaining things. He helped me learn a song to play at my friend's wedding. I didn't think I'd be able to do it, but I was able to learn the song just in time! Thanks Allen!!! After graduating from Salford University, England with a Bachelors degree (Honors) in Music and Composing I worked for a short time as a commercial "jingle" writer, before moving to San Diego, marrying my dream girl, and opening my own music recording, teaching and production studio. From there I have been teaching lessons, recording bands and writing music for independent film ad video games for the last 6 years. Throughout this time I've been continually performing live in venues all over California. I teach both from a privately rented studio in Santee and from my home studio in La Mesa. Both are fully equipped for guitar, bass and drum lessons and even have recording facilities! In my lesson plans I try to combine theory and technique with practical application (that is, playing music and rocking out!). A typical lesson begins with a warm up and review of last weeks' lesson, and then moves to a new concept or technique. Once this new idea is understood, we give it a practical application by using it a song the student is familiar with. We finish up by setting some homework and answering any questions the student my have. My lessons are structured and goal orientated (I want my students playing songs they love as soon as possible to keep the inspiration and excitement going!) but I adapt each lesson plan to suit the student, accommodating different musical tastes and learning styles. Most important I keep the lessons fun and engaging - it's the best way to learn! Fulling equipped, professional teaching studio. Guitars, drums, amps, PAs, Pianos, Mandolins and much more! Very versatile both in preferred styles and my ability to adapt to students requests. Can cover anything from jazz to metal, or pop to blues, on guitar, bass or drums. Really fun and listened very well. I’m excited to start this musical journey. Today was my 8 yr old grand daughter's first session with Dave and she was a little nervous about her first lesson. Dave was very patient and very pleasurable. On the way home, my grand daughter told me she liked Mr. Dave, had a lot of fun and can't wait for next week's lesson. Great teacher! I learn so much more in my lessons with David than I think I ever would anywhere else. He is very patient and breaks down music theory so it is easy to understand. Bass is tricky for me and he helps me understand my place more and provides context. He also instills a lot of confidence in my abilities and gives great feedback. And he's a lot of fun! Reading bass staff, chord patterns and bass theory. Over the course of my musical career, I have had the opportunity to learn from many musicians. From University Professors to Street Corner Musicians, I have gathered much knowledge on how to play music. Applying that knowledge to my guitar playing has opened up many doors of opportunity and has made my life very interesting. One of my talents is to take complicated ideas and convey them in easy to understand ideas for my students. I now wish to share all my knowledge and experiences with you to enjoy a life of music. Students of mine have been able to create their own music to record and perform. Ensembles that I have directed have performed at many local venues. I have also invited students to join me at my performances to help them become more confident in their playing. Each lesson is custom made to directly benefit each student. The music the student enjoys listening to, is explored to identify what skills are needed to play that music on their instrument. Exercises are then tailored to give students the finger strength and dexterity to directly attain those needed skills. Favorite songs are also examined to understand the musical theory concepts that were used to create those songs. Once those concepts are understood there is no stopping the student from creating their own music. Parents and guardians are more than welcome to be part of the process. Involving parents in their children's education is my pleasure. My studio has a comfortable waiting area where you can wait until the lesson is done. Questions are always appreciated. Two chairs, music, computer, internet, digital recording equipment, guitar, guitar amps, parents can sit in on lesson, bass, ukulele. I provide whatever is necessary. Student should provide their instrument, music stand, and two chairs. Access to electrical outlet not mandatory. My 9-year-old daughter and 11-year-old son have been taking uke lessons for 3 weeks now and they really enjoy Ruben's style of teaching; so do we. He provides a great combination of making it fun while also really teaching them the foundations of music. They are already reading and writing some music and they enjoy doing their music homework. Most important, they are having fun at the lessons and while practicing at home. Great fun, well done. Excellent teacher! Ruben IS the TEACHER, calm, very knowledgeable a great professional and kind and KNOWS THE MATH behind the music. Even though I have dabbled for 40 years with the guitar I feel secure in my baby steps. Learn your favorite songs, grooves, jams and tunes! The first few lessons are about establishing good ears, good time feel, and a few fundamental techniques for the left and right hand. After that, it's all about tunes and the kind of music you intend to play. Lessons include ear training, rhythm, performance techniques, a personalized tune list, in addition to common bass practices. Optional courses of study include improvisation, music theory, composition, arranging. *Experienced teacher and professional musician specializing in beginner music lessons. The Brian Setzer Orchestra, Great Good Fine Ok, Gilbert Castellanos, 10,000 Maniacs, Tori Roze & The Hot Mess, Gaslamp Quarter Jazz Orchestra. *Recorded on national tv ads including Dreyer's, KFC, Coca-Cola. *Over 6,000 private lessons taught to over 300 students. *Students have included: ages 4-96, beginners with no experience, undergraduate music majors, scholarship award winners, members of the San Diego Youth Symphony program, many locals in San Diego, and online students from around the world. rovide a positive musical experience for all students. For some this includes rigorous preparation for an audition of some kind, for others it may be an introduction to music fundamentals to foster better listening skills and greater artistic appreciation. All students will be challenged to improve their listening, timing, and technique. All students will learn to play songs that they love. 1. Make a three-month commitment to weekly lessons. 2. Practice at least three times a week, for a minimum of 15 minutes each time. *Scheduling policy: No Cancellations. If the student is unable to attend a lesson as scheduled I will use the time to email a video lesson to the student. Other alternatives: online lesson, reschedule, add time to next lesson (based on availability). Students may put lessons on hold up to once per quarter with at least one week notice. *Due to limited availability I am no longer able offer lessons every other week. To continue weekly lessons, students must maintain at least 90% attendance or the time slot may be forfeited. Jordan was born and raised in the El Centro, California where he began playing the alto sax in the elementary band program. At the age of 12, he began his study of guitar and drums, performing in several rock and ska bands around his home town and San Diego. At age 14, is where he found his love for brass instruments when he took up the trombone. While in high school he became a soloist with the Imperial Valley College Jazz Orchestra, under the direction of former Basie trumpeter Jimmy Cannon. That lead Jordan to accept the Constance Weldon Music Scholarship to attend the University of Miami in Coral Gables, FL. While performing in South Florida Jordan appeared with major acts including 10,000 Maniacs, and appeared on the Spanish television show "Calle Ocho." He also gained invaluable experience teaching in Miami public schools. His first teaching assignment was at Hialeah-Miami Lakes Senior High School where he directed 3 beginning bands, Concert Band, Wind Ensemble, and their highly decorated Jazz Band. Later Jordan moved into the elementary setting, teaching vocal and instrumental music for grades K-5 at Cypress Elementary. In 2007, Jordan returned to California to pursue a music career in San Diego. He can be seen performing all over San Diego, Orange, and LA Counties in styles ranging from rock, jazz, funk, blues, hip-hop, Latin, and more. He performs primarily on trombone, piano, and guitar, but is known to pick up percussion, harmonica, and other wind instruments as well. In 2011, Tori Roze & The Hot Mess were nominated for a San Diego Music Award in the category of "Best Blues Artist" after the release of their first album "From The Hip." They released their second album "Turbulence" last December, and are heard regularly on local San Diego radio. This album has also been nominated for Best Pop album for the 2013 San Diego Music Awards. In 2013, Jordan completed his Master of Music degree in Jazz Studies from San Diego State University. On stage, Jordan is a talented and versatile performer. He is known for his trombone sound and improvisational ability, as well as his positive relationship with his fellow musicians. In lessons, Jordan is energetic and creative. You can expect a laid back, yet focused environment. Most of all, you can look forward to progress! Hope to see you soon. In home beginning music lessons. This dude knows his stuff. Knows teaching and knows harmonica. Tunes class to students capability and goals. Flexible. Because I have played Guitar for a long time, it was easy to play Bass Guitar. I have played Bass Guitar in different Rock ensembles and enjoyed the instrument. In this course I'll go through scales, accompaniment patterns and basic playing technique. After this course you'll be able to play a lof of songs alone and together with other instruments. I believe that music is rooted in all human beings and cultures in a reach and vast variety of forms. Music unifies and engages thinking and feeling in a direct and immediate way. Music influences individuals simultaneously on different levels of consciousness and form an important device for learning, recreation, arranging of conscious and unconscious impressions and at the same time for characterizing and conveying ideas and thoughts. This as a point of departure characterizes my teaching philosophy, which strives to create a climate in which my students can experience continuous musical, intellectual, and emotional growth. 3) Bachelor in Electrical Engineering. I speak english, german, swedish and farsi and love to work with people of all ages. Bijan is an excellent teacher. He is truly a professional; very knowledgeable and attentive. He is also patient with the young ones. I highly recommend him! Mr. Bijan is the best instructor that someone can have. He's knowledgeable, passionate, and caring. I had him for cello lessons. He uses the time efficiently, and teaches you as much as possible in each lesson. I strongly recommend him. Well structured lesson plan covering all aspects of music, and specifically designed to help you reach your individual goals. Styles taught: Rock, funk, jazz, country, blues, fusion, folk, R&B. Kevin T. is a music professor at MUM, Vice president of the San Diego Songwriters guild, and CEO of Songwriting Planet. He is an instructor of guitar, bass, voice, piano, songwriting, composition, orchestration, jazz arranging, music theory, ear training, production and engineering, and music business and career development. He graduated from Musicians Institute with a performance certificate, received his BA degree with honors from Berklee College of Music with a dual major in Songwriting and Performance, and received his Masters degree in Music Composition from the University of Miami's Frost School of Music. en the songwriter, arranger, and bandleader for several original music groups. Stress Factor Zero combines rock with funk and jazz. Cloud Ex is an acoustic group combining Afro Cuban and Peruvian percussion with folk rock songs. His most recent band Stratosphere is a modern rock and funk band for artistic rockers and visionaries. They blend diverse styles of rock music with a fiery blaze of Latin percussion, sensuous saxophones, and poetic melodies with a message. Their first CD received radio airplay on over forty stations across the U.S. and Canada, and they are currently working on their third CD. Stratosphere performs throughout Southern California and is currently setting up several short tours in various cities across the U.S., Europe, and South America. Well structured lesson plan covering all aspects of music, specifically designed to help you reach your individual goals. I have very much enjoyed my classes with Kevin. We have made great progress and the classes have been a good mix of focusing on the important fundamentals and exploring things specific to my interests. I think Kevin has the knowledge and ability to teach you anything you would want to know about music! Kevin was very helpful and helped me understand concepts of music theory very clearly. Thanks!! Nikola M is locally recognized as a guitarist extraordinaire that specializes in teaching and performing progressive rock. 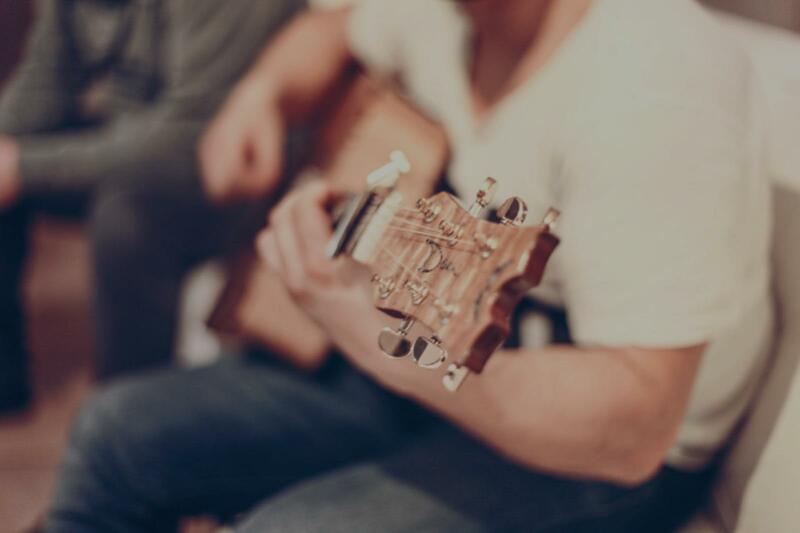 Nikola's proven teaching methods have been acknowledged by San Diego's finest musicians and his students range from beginners to highly accomplished professionals. In addition to stints in various rock bands, studio session work and 16 years of playing experience, Nik's development of teaching guitar was made possible by having achieved a firm musical background throughout his earlier years of performing with orchestra ensembles. As a classically trained brass player, Nikola studied music under college guitar professor Gary Tuttle and award winning SDSC band director/guitarist Phillip S. Marcus. nstitute of Technology co founder Joe Diorio) pro touring guitarist Christopher Eck of the band Masterguru, former students of guitar virtuosos Greg Howe and Joe Stump and many other serious amateur and professional musicians. Heavily influenced by legendary virtuoso guitarists Eddie Van Halen, Steve Vai and Yngwie Malmsteen, Nikola's goal as a teacher is to convey his knowledge and expertise of the guitar on to others while emphasizing his own style, which exemplifies speed, intensity and finesse. While his exploits in rock guitar gymnastics continue to attract and inspire new players, Nik's approach to teaching is simplistic, yet highly effective and suitable for young beginners and adults of all ages. Heavily influenced by legendary virtuoso guitarists Eddie Van Halen, Steve Vai and Yngwie Malmsteen, my goal as a teacher is to convey my knowledge and expertise of the guitar on to others while emphasizing my own style, which exemplifies speed, intensity and finesse. In addition to teaching various genres like pop, jazz, country and folk, I specialize in instructing virtuoso rock and progressive metal guitar techniques. He's an excellent instructor and very talented musician. He is very knowledgeable of all the music theory and techniques I need to be a good bass player. I highly recommend him to anyone. Students should expect to learn a variety of topics such as naming different parts of the instrument, tuning, technique, music theory, function within a larger ensemble. I've been teaching/tutoring music since 2007 with experience teaching music theory, aural skills, piano, and guitar. I can help students with a variety of musical tasks. The program I was enrolled in at SDSU ensured that I had a good grasp of a wide variety of instruments. Piano students can expect to be started with Faber Piano Adventures. Guitar students may get Alfred's Guitar Course or a book on classical guitar depending on the maturity/level of the student. After a few months, beginning students should expect to have gained a firm grasp of the basics of understanding music notation and should be able to play at least basic pieces. Students obviously are not expected to bring a piano but if you are taking guitar/bass, do bring one. ts to have their own instruments, especially piano, and amplifiers and cables if applicable. If I am teaching recording then they should have their own workstation with computer, interface, and either monitors or 2 sets of headphones. I expect students to have their own copies of any relevant books/materials as instructed. I will bring my own writing materials and guitar if necessary. Piano - classical, rock/pop, jazz. Guitar - rock/pop, classical, and jazz. I prefer to start students with classical when possible as a means of getting hands to start finger-picking early. As a first time piano student at age 70, I find Masa. very patient with me. He encourages me to understand music theory as well as playing. I enjoy the lessons very much, even after 15 months! Being the first lesson, I had an instant connection and a really great lesson! I have a good deal of knowledge in understanding the Bass and coming up with some good Bass lines within a groove. A fun, friendly, and professional Music Instructor at your service for Voice, Guitar, Piano, Bass, Drums, & Ukulele! I have a BA degree from Florida Atlantic University in Music Performance for Classical/Flamenco/Jazz/Blues guitar and I've also performed on the Piano/Keyboards for a couple different bands too. Love to play & teach pretty much all styles of music! It is always a pure joy & truly rewarding to see my music students grow and flourish in their musical abilities. I have been enjoying doing this now for 20+ years- all ages & levels. I am also in a multi-dimensional rock project and a recording artist with my band Vision. John, my husband, is enjoying his classes with David. He's had a guitar that used to sit in the corner of the office, but now he practices on it almost everyday! Thank you David!! I took lessons with David for a few months and I was rather thrilled with the lessons in the beginning and quite upset towards the end of our time together. David is a great teacher for the general hobbyist or child but I outgrew his lesson homework within 8 weeks of lessons. It was at this point that I asked David to record the vocal warm ups so I (as well as other students) could practice more conveniently. He assured me he would, and week after weeks, the warm ups weren't available. David knew I only had a limited amount of time until I was moving from the area. He had the idea that we should record one of my original songs using his homemade recording studio. He wasn't very knowledgeable of the program he was using at the time and I was his first student who he tried this on. We ended up using about 6 of my lesson credits on this song (which was out of time from the beginning). After a while of minimal progress on the song, no recorded vocal warm ups and plateau in my vocal learning, I decided to cancel lessons with David earlier than decided. David is a very friendly person with a moderate knowledge of most instruments but I would not recommend him to someone who is serious about advancing their craft on a professional level. David is as good as they come! 110% recommend! Can't find a teacher in Lakeside, CA? The average cost of 60-minute bass guitar lessons in Lakeside is $40. While the exact cost will vary depending on the teacher, type of lesson, and your location, you should expect to spend anywhere between $40 and $40 per hour. For the best experience, we typically recommend 60-minute bass guitar lessons. However, students looking for a more affordable option may want to consider a shorter lesson length of 45 or 30 minutes. On average, 45-minute bass guitar lessons are 13% less expensive at $35, and 30-minute lessons cost 38% less at $25. Curious how much bass guitar lessons cost in your area? Do a quick search to get local prices for the best bass guitar teachers near Lakeside. t is easy to understand. Bass is tricky for me and he helps me understand my place more and provides context. He also instills a lot of confidence in my abilities and gives great feedback. And he's a lot of fun!" San Diego, CA teacher: David B.
to play, which makes it more fun for my daughter and results in more practice!" San Diego, CA teacher: Justine D.
"Very excellent teacher! Funny and clever"
San Diego, CA teacher: Kevin T.
he was a great teacher for me, as a beginner." "Great teacher! Jordan is a real pro while making the lesson really fun and chill. Would definitely recommend him for others." San Diego, CA teacher: Jordan M.
o practice! She gives me things to work on but is always very encouraging! I feel like I am learning a lot. Most other teachers don't give you songs to play on your second lesson, but she did and I felt totally ready for it! I was really hesitant at how lessons on Skype would go but they rock! I am able to see her show me things and able to hear her play her bass guitar. We are now sometimes even able to play duets together and I think that is a really neat experience. She is teaching me all the things that I would need to know if I were going to play in a band or write my own songs. Overall I have had a great experience with her and would HIGHLY recommend her to anyone!" San Diego, CA teacher: Allen D.
"Great instructor, very knowledgeable and flexible"
ur goals and the types of music you like so she can tailor your classes to that style."